It’s too hot. It’s too cold. It’s raining. It might rain. It rained yesterday. I have errands to run. The ground is too soft. The ground is too hard. I don’t have time. Now, don’t get me wrong, I enjoy riding, and I really have no idea why I’m always finding excuses not to ride. Maybe I’m just lazy. I don’t think it helps any that I have the kind of horse who could go a month without being ridden, and he’d still be the same old horse once you finally find your way back to the saddle. It’s nice to have a well-trained, steady Eddie type of horse, but it certainly takes away any sense of urgency. 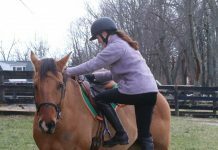 If I’m lazy and don’t ride for a while, my horse will not buck or take off or forget everything he knew as some younger horses tend to do. I might be sore the when I ride after a long hiatus, but other than that, I don’t really suffer any consequences. All that said, I have had some genuine excuses for why I haven’t been riding lately. It started with a gunky eye (Snoopy’s, not mine.) You’d think I’d know better than to wait it out, but I didn’t call the vet right away, even though the gunk was exceptionally persistent. Still, I opted not to ride him and instead spent my time at the barn trying to keep it, and his fly masks, clean. When I finally got smart and called the vet, he diagnosed Snoopy with a corneal ulcer along with secondary conjunctivitis and uveitis. It sounded pretty intense to me, but he assured me that it’s a common affliction this time of year, and said the ulcer was superficial and should heal quickly with proper treatment. He prescribed four different ointments to be administered four times a day for the next two days, plus Banamine paste once a day. I spent a lot of quality time at the barn that weekend, but none of it on horseback. As an aside, I did re-watch HorseChannel’s video on administering eye medications and tried to follow Dr. P’s advice, but it was never quite as easy as she makes it look. Poor Snoopy was as good as he could be, but he wasn’t about to hold still while I messed with his eye every four hours. After the first few times he’d see me approaching with the carrot in one hand and would back away a couple of steps because he knew what was in my other hand. The vet came out on Monday morning and pronounced his eye 100% healed and said he could go off the ointments and Banamine as long as nothing flared up again. Huge relief! A couple of days later, after an unusually exuberant night in the paddock, Snoopy walked in with one shoe missing. He was about due for a reset anyway, and as luck would have it, another boarder had the farrier scheduled for Saturday. I managed to find the wayward shoe out in the paddock, and the farrier was nice enough to fit us in. “Oh, just ride!” my co-boarder said. So I did. And then I remembered why it’s a bad idea to ride in shorts, at least with a saddle. It ended up being an abbreviated ride, which I figure is probably just fine since Snoopy’s returning from some time off. I went out the other night, properly attired, and rode around the farm for a while. It was a good ride, and it made me wonder why I ever have those days where I’ll find any excuse not to saddle up. So now, barring any more minor disasters, I’ll be setting my alarm for early o’clock and putting in regular saddle time again. No excuses. As for riding in shorts… ouch. I can remember the first time I ever rode a horse, and I stupidly wore shorts. It actually wasn’t too uncomfortable, until the next day when I started suffering from the MAJOR sunburn that I got, plus aching muscles I’m sure… ah, good times. I’m the type of person that would come up with plenty of excuses TO ride. I’d say that in this economy, having a horse to ride is truly a blessing. I agree that in this economy as well as other problems our country is having horse get us through! Riding with shorts *wince*, MAJOR ow! Owning a horse is a HUGE priviledge. It is a blessing and a gift. You should be grateful to have such a noble amazing creature. They are so kind to us, gentle caring and forgiving. And to leave them in their stall, bored and alone is so cruel and inconsiterate. After all they do for us we should make time to take them out play with them, groom them, ride them. Horses LOVE to be ridden and taken out of their stalls for a walk or to be handgrazed. Making excuse to not ride and therefore not properly take care of your horse is cruel and selfish.